Nowadays the modern decoration concept has taken a transition to care for home furnishings and home decorations, and bedroom "soft decoration" has gradually formed a hot topic that people concerned about increasingly. 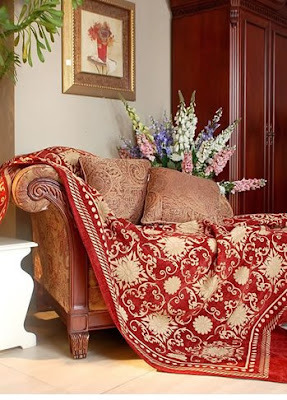 As to start with "soft decoration", you could only get a warm and romantic home. At this gold autumn, the home decoration began to entered its prosperous time, many friends began busy and they are bound to in the face of numerous home decoration products and room design styles, so which kind of home design should to choose? The living room is cozy and quiet, sun lights sprinkled in gently, relying on a large soft fabric sofa watching beloved book, enjoying the afternoon sunshine, warm, calm, on the white table there's a hot self-grinding. Romance is exists in these home furnishing flakes, in which raw white color of furniture is more important details. Modern decorative arts has inducted the creative ideas of modern abstract art also its fruits into the modern interior decoration designs, thus strived to create unique but simplified decorations, these designs are simple, popular and fresh, which are more closer to people's daily life. This style design featured and constructed with curves and nonsymmetrical lines, such as footstalks, buds, grape vines, insect wings and various of elegant and waved physical patterns in the nature, which were been applied in decorations of walls, balusters, traceries and furniture. Continental's court style design particularly about extravagant habitudes, in a European luxury style design house there are commonly full with laces, complicated creases and luxury brand European-style furniture, thus to create a luxurious style, with soft bed, complex crafted crystal lights, a resplendent bedroom with thick European flavors just constituted. 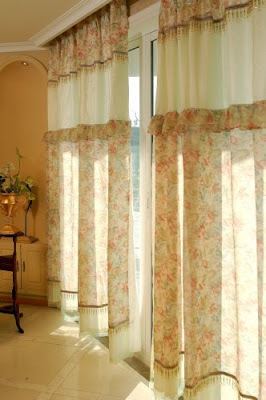 Continental Court Style curtains are generally fitted with double design water wave valance, curtain cloth commonly use those flashing fabrics in elegant pale gold and raw white color. American pastoral style put simplicity at a premium and uphold freedom designs, which was reflected in simple, leisure, green plants, rattan Dining Chairs and network decorations, it is elegant and comfortable, in this style, wooden furniture are generally been kept with their natural wood grains and painted with gloss paints; curtain fabrics are mainly used fabrics with patterns of flowers in the nature, natural colored stripes or pure white voiles, which are concise, fresh and natural. Black and white style design will go an exaggerated or a minimalist route, if you choose this style design for your home decoration, which will help you to subvert the traditional home decoration style immediately. The white and black series curtains are mainly themed with classical white-black color, whose decent patterns and geometric textures will soften those stiff and blunt expressions in the room. It is worth noting that during the course of the room arrangement, you should take care and apply the black color with a moderate scale, too much dark furniture would bring pent-up feelings to peoples in the room. Otherwise, be equipped with several orange cushions or some red furnishings in a small area, which will mitigate those cold and serious atmospheres in the room. The decorative material of new Chinese style mainly are wood material, which particular about carving, painting, elegant sculpt, each furnishings are all reflects grand and luxurious characters, each decoration could arouse people to recall their past times, and produce a yearning for a good future. Chinese-style curtain mostly use fabrics with thick colors, whose texture and patterns are full with national flavors, and the patterns of which in pursuit for simple, grand and exquisite styles, especially those Chinese elements such as tassels, clouds emblems and Mandarin collars and so on, which are applied in the New Chinese style decoration frequently.